Well everyone… It’s right around the corner. Quilts of the Plains 2012, that is! There is a great webpage devoted to the upcoming outdoor quilt show in Wray. Please check it out at www.wraychamber.net/quiltsoftheplains.php and see for yourself. If you’ve entered quilts before, the procedure is the same as last year. There are seven different categories… so you’ll certainly have many things to enter. If you haven’t yet displayed your quilted items in this show… I challenge you to do it this year. Who knows… YOU might be the winner of the viewers’ choice top prize, and brand-spankin’ new Janome sewing machine. There are some cool vendor booths, and YOU could be the winner of our great raffle quilt, which was donated by Quilters’ Anonymous. All you need to do, is buy that ONE lucky raffle ticket! 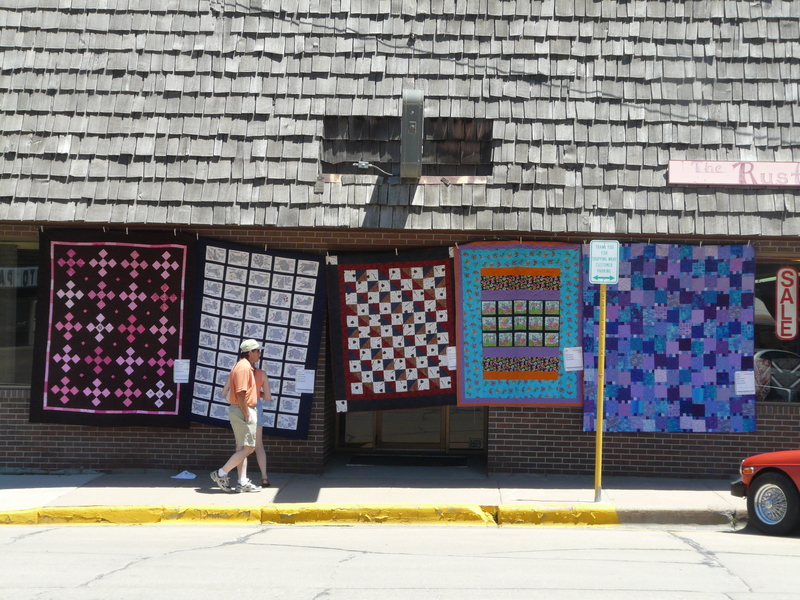 Here is an example of how the quilts are displayed along the Main Street. Please help us to spread the word. Quilts of the Plains is awesome… and it’s less than four weeks away!